The ancient chapel and belfry of Notre Dame de Beauvoir high above the village of Moustiers Ste Marie in the Alpes de Haute region of Provence in France, Europe. 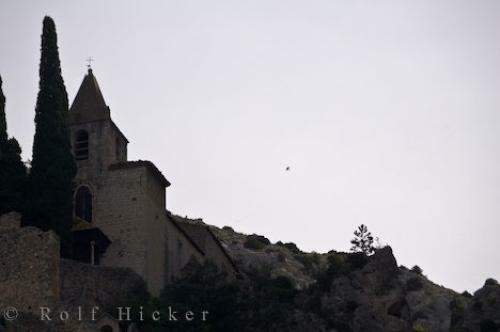 Photo of the ancient chapel and belfry of Notre Dame de Beauvoir in Moustiers Ste Marie in Provence, France. ... over an hour) the magnificent view of the hills and valleys of the Alpes de Haute and Lac Ste Croix will take one's breath away - if there is any left after the climb.The 12th Century Chapel and belfry of Notre dame de Beauvoir in the village of Moustiers Ste Marie, Alpes de Haute, Provence, France, Europe. I photographed this photo with the digital SLR camera model Canon EOS-1Ds Mark II, aperture of f/6.3, exposure time of 1/400 sec. on ISO 100, as always I used a original Canon Lens, the focus lenght for this picture was 250mm.